Gomis deal agreed for several days apart from agent's fees | NUFC Blog. 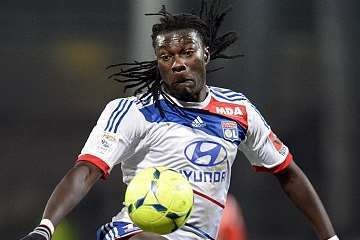 Gomis: It’s all agent’s fault claims Lyonnais President. Whilst the recent narrative in the English media has been that Olympique Lyonnais turned down Newcastle United’s last bid for Bafétimbi Gomis, and also that Newcastle walked away from the table on one occaision, Lyonnais Chairman Jean-Michel Aulas actually confirmed several days ago on his Twitter and elsewhere that a deal had been struck. “We have accepted the proposal of Newcastle, which is €8m, plus €2m. The agreement is now linked to the acceptance of agents’ fees. I understand that the problem is in the amount and manner of payment of commissions. It’s not over yet though. As I mentioned, it has actually been several days since the sides reached an agreement over fees yet things are still in limbo, even so, we should know one way or the other over the next few days. I am holding my breath on this one. I have lost all faith in the media and there fairy tale bullsh*t.
Same. Now get Remy in too and we will actually have three decent strikers for the first in forever and of course more options. It is obvious he hasn’t met Joe yet. He will probably meet with the agents upset them in his normal Non PC way and tell them he is only willing to pay 200,000 Francs for someone with hair like that. dokky, I’ve been following it in the French media since the end of last month and they have been much closer, though it’s still not totally clear what is holding things up now. As well as the agents fee there has also beek talk of Newcastle trying to force Gomis’s wages down by 3000 euros per week, or Gomis trying to trying to force them up or whatever. However, I was also reading what Lyon fans were saying and a few seem as if they would be glad to see the back of him. He’s never really got me that excited like Bony, though I haven’t watched Gomis as much. Gouffran has a respectable record playing in the centre too, Phisix. if this is true then great! still think we need to get competition for cabaye and tiote plus a cb. From what I have seen of Gomis, I have always likened him to Ken-Wynn Jones. But possibly with a bit more consistency, hopefully. I had similar thoughts, Grumpy. Not Kenwynne Jones in my case but more like ‘I hope thet’re not expecting an elegant French cavalier ’cause he’s more like a big English lad who’d be good at Stoke’ or something like that. I haven’t really done my homework on him though. Center forward, either side of a front three or how he played at Newcastle last season, dokky. Center Forward was his most usual position before he came here though. My French s getting rustier all the time. I did have a bit of a bash at German once when I knew a German lass but it’s completely bonkers! @ 9 & 10: I think that’s about right. Worryingly, he’d be the type to play alongside Cisse in a 2-striker set up. Then again, he’d be a solid CF for a shifty Michu-type to play off of-I so wish Cabaye would be tried in that role, or HBA, or Marveaux. bifftoon @ 8: Really? CM? Competition other than Sissoko, Anita, Bigirimana, Vuckic and in a pinch, Jonas, Colo or Mapou? I’d prefer a wide midfielder or two and another fullback. At least we are getting close. Also, seems ‘Arry has been told he isn’t the one deciding on Remy. With the stupid transfer fees this window a loan wouldn’t be a bad deal as I think the wages wouldn’t have to be paid if there was any jail time. Would Ashley pay the reported 80k a week? That seems about the going rate for a top striker so he he might be forced into it. Talking of stupid transfer amounts. Is Bale, who had a great game in Milan and half a season of excellent football really worth all that money? This could be the biggest transfer folly of all time. It doesn’t make much sense as he is a free kick expert and do you think he will get the ball off Ronaldo to take any? Chiming in… If we get Gomis and Remy you have to say that on paper we have an excellent squad. This will re-focus the attention of Pardew. Can he succeed with good players and compete in the top half of the table or will he bugger around down the bottom end? That, with apologies to the Bard, is the question. tunyc: you missed Perchy, who did a good job when asked to fill in as a defensive midfielder. Oh. We sold him to Wigan for 750k. Of all the penny pinching that made the least sense to me. Pardew would play him ahead of Anita FFS so he must have rated him. It appears we are overfilled with centre fielders who play inside, the old inside right and left., Gouffran, HBA, Tiote, Bigirimana, Sissoko, Anita, Gosling, Cabaye, Marveaux and yeah, I know we have been playing Goofy and HBA on the wings, because we have loaned out our only winger Ferguson. That is unless you count Jonas as a winger, which I don’t . It appears Bigiriman will fill in for Tiote, Anita for Cabaye, with Gouffran, Marveaux and HBA, competing for similar roles, where then is our box to box Sissoko going to fit in. And what do we do with Gosling and Jonas ? Time for a bit of trading, we are overstocked with inside midfielders and short of wingers . Sinclair would fit well , but it appears we are going to be stuck with guys who are unhappy not to be playing regular, how did this accur ? Who is in charge of bringing in players FFS. At the back we have Debuchy, Taylor, Yanga M’Biwa, Colo, and Santon, with our youngster Haidara being offered out on loan, why ? It appears Bardsley could be brought in cheaply, I have always thought of him as decent, why not. That could give us adequate coverage at the back. Up front we will have Cisse, Gomas and Remy, sounds adequate. So all in all, though a bit weak in CD’s not a bad squad, though not that deep and it will require some inside midfielders to play wide. I realise there are those such as Jonas ,the Ameobis, Vukic the barely known Amalfitano and some i may not have mentioned . But as injuries has always played a major role throughout our recent past, we will probably need everyone we have, but we will have to pay better attention to our selecting players for specific roles. I’ll tell you who “would be like a new signing” – Marveaux. He was signed with an injury and had a reoccurrence and a few niggles last year. I don’t think we have seen anything like what he is capable of. Hopefully, he will be fully fit for the first time in about 4 years, I sort of doubt it though. Chuck: you missed AndyMac’s mate Obertan in your player analysis. Did you hear about coventry? my best pal supports them and he is devastated going into liquidation over 1mil! the game has been ruined by tv money there aint even any passion in the game anymore. Also suarez threatening legal action with liverpool if they don not let him speak with real, after all they done for him it pathetic! oh and 100million for bale? if he is worth that i must be worth at least a mill. @19 i agree i really like marveaux, if obertan never played for united i doubt he would even be in the picture. When we have a full squad we have a really strong team, we would finish well with a decent manager who knows what he is doing. I am not really bothered about signings as long as we get a couple of strikers. We was one of the busiest teams in january people seem to forget that. dokky, I always think of Jimmy Hill when I hear about Coventry. Little Vurn even more so because we saw him even less. @worky is that the guy of MOTD with the massive chin? lol i remember that bloke it’s a shame though whats happened destroyed by some twa*s just to get the stadium on the cheap. Here’s a list of a possible line up. I hate doing the line up thing a la Ed’s lot. The reason I am doing it is to point out that they have all played for their country except Elliot. Most are full internationals except Taylor and Santon, I think. Even they were mentioned as maybe being full call-ups last year. I know I am stating the obvious @27, but it takes a special talent to f*ck that squad up (minus Gomis) and lose 6-0 at home. Are we fishing in the wrong pond? Aye dokky. He’s more important than people think he is. He did alot to shape the modern game at Coventry, as well as getting rid of the maximum wage for footballers. Can players get signed on the weekends or it just weekdays only? I believe the French national team are going through a rough patch but they are better than USA and probably England. Lets see how far we all get at the world cup, then decide. In terms of value for money we are fishing in the right pond, now the price of Spanish and German players will be sky high (and they will stay in their own league more now like Italian players more traditionally.) What English player could we buy for £5M or so that would be as good as Cabaye? It would be £20M for a young Frank Lampard type at least. We couldn’t even get Michael Carrick and he’s a geordie! Let’s say we do get Gomis and Remy, that will be 8 players in 12 months – the 5 in January, plus Anita. That’s a big squad overhaul. Maybe, just maybe, people are being a bit harsh about our transfer business? Worky has said Carr is stuck on the Eurostar and has a point. We should definitely be in Croatia and Uruguay for example. Physix: remember the clubs do offers by fax machine. I am serious, I have seen it mentioned quite a few times recently where it has been said a club has faxed an offer. Who even has a fax machine now? Maybe, since it the Agents who are the stumbling block, Uncle Joe can text or call on the his mobile. Welcome to the 21st Century. GS-I like your idea of looking at Uruguay, they are a national team I really admire at the moment. I would hope we have people looking around Brazil and Argentina as well but I doubt it. Although i have heard of this, I’ve only seen a couple of grainy clips, On Youtube. Some posters from other boards are calling him, The Emile Heskey Of France! Sorry, meant to type, Although i have heard of this kid. DJG, Spain is knacked, it’s having a closing down sale like Sports Direct. There are lots of cheap players coming out of there. Just look at Swansea for a start. It’s easier to bug a phone than you think using scanners and such. Journalists and private dicks have been doing it all the time recently, just look at the news. I could do it if I really wanted to. Grumpy called him the French Kenwyne Jones. Worky, I watched him playing for France, A few years back, When we were linked with him then. I seem to remember he got substituted, And didn’t have much of an impact on proceedings. Like i have said previously, I haven’t seen too much of him to be honest, So i cannot comment on how good he is. I remember there were comparisons between him and Didier Drogba, And this lad was going to fill his shoes, And be the new big thing. He has been quiet for the last couple of years, And there are a lot of people who don’t seem to have a good word for him. What i have heard about him, Is he’s not a player that will score lots of goals, But he has good skills, And is good at bringing others into the game, And can create chances for other players to score. Joe, if they’re a big, powerful, black African centre forward type, chances are they will be called “the new Drogba”, “baby Drogba” or some such thing with “Drogba” in it at some stage. Both Gomiis and Remy will do just fine in the PL, though we can’t expect them to be RvP’s. In class, they will get their goals. There is still a while before the window closes and we should be seeing increasing action take place. According to rumours we should expect an offer from PSG, for Cabaye and anything in the region of £20m., will be grabbed by Ashley and rightly so. If it happens then a bid for young McCarthy, would be the way to go, at twenty two, he has established himself as both a good playmaker and is versatile enough to adapt to various changes of tactics, with a lot of the plays being set up by him, with excellent vision for the killer pass. As you can see I think the kid has a big future ahead of him. Better than Debuchy ?, perhaps not right now, but definately bettter than Anita then, plus Debuchy didn’t have a great season last year and yes I believe he will eventually surpass Debuchy and at twenty two, a home grown, with a few more years ahead of him. Get him now as the price will only increase as time goes by. Reminds me of when we signed Aaron Spear and he was being called the ‘new Rooney’. He’s now playing for some team in Iceland. Regardless of what they decide to call Gomis, both he and Cisse will get their goals, with the addition of Remy, we will have more than adequate coverage up fron. Whereas relying on Shola or Campbell, would have made us candidates for relegation. I would now like to see us sign, Sinclair, McCarthy and Bardsley as a backup. Though I’m not holding my breath on it happening. By the way what happened to the Dutch goalie we were bidding on? Hughton signed Jacob Butterfield from Barnsley last season for a bit of compen and he was described as “the new Gazza.” He made a couple of cameo appearences for Norwich and was sent out on loan twice. With the homegrown rule about to come into effect soon, should we not be combing the UK youth sides for some decent prospects, like Bigirimana, either that or bring in some young prospects, that can eventually through time be accepted as homegrown. be able to produce good young players in general. Certainly that’s not true of other countries, otherwise why have we a majority of foreign born players at presence ? …we don’t have Gomis just yet. GS-if you take away the assumed signings and look at it that way: 3 windows, 7 senior players in-counting Amalfitano. In that time, 4-5 senior players (Best, Simpson, Perch, Ba and Forster) have left. Ranger was also cut loose, rightly. Gosling would have gone but he couldn’t agree terms. I don’t think we’re being overcritical. I just want to see a balanced squad. I’m not even sure we need both strikers, but either way if we get a wide midfielder and maybe a fullback without losing anyone (ok, Obertan & Amalfitano can go) we may get close to that. I’m not holding my breath though. Chuck, It’s already in effect and has been for a while, but I agree with your point absolutely. I also believe that a club should have a decent local contingent too.